China, T'ang Dynasty Rebel. Shih Su-ming, AD 757 to 761. Bronze value 100. S-407. Date : The rebel ruler Shih Su-ming ruled from AD 757 to 761. Denomination : Bronze valued at 100 Kai Yuan. Size : 36 mm. Weight : 20.98 grams. Grade : VF with a mottled green-brown patination, with minor encrustations. 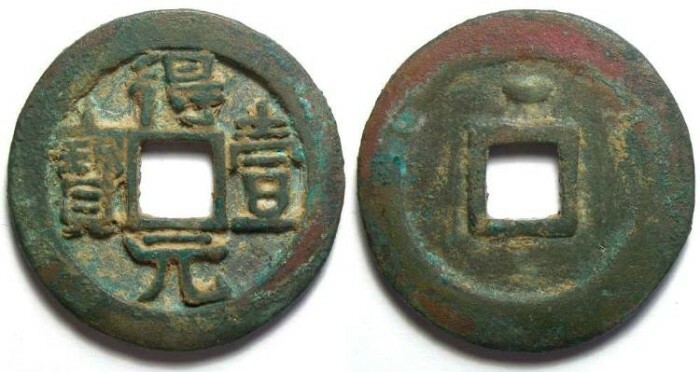 Obverse : "TE-YI YUAN-PAO" meaning "currency of unity". Reverse : Small crescent at the top. Although Shih Su-ming was a rebel Emperor, at the peak of his power he controled a vast part of the Empire and may have held more power than the official Emperor.